Newsprofin is the PUP that uses misleading techniques to prevent removal. Use Reimage to locate malicious components and get rid of them faster than with uninstall instructions. A full system scan blocks virus reappearance and prevents traffic to malicious domains. Newsprofin is an adware which leads to less than reliable websites. Newsprofin is an adware which is designed to redirect users to phishing sites and display less than reliable ads. Experts categorize this application as a potentially unwanted program (PUP) due to its activity. Note that Newsprofin.com targets to initiate changes in most popular browsers, including Mozilla Firefox, Google Chrome, Safari, and others. This way it can flood the users with potentially dangerous ads and redirects to shady pages to gain advertising revenue. As most potentially unwanted programs, so-called Newsprofin virus enters the system with the help of software bundling technique. Later, it modifies specific browser settings which allow the adware to collect information about the owner of the computer. The collected data includes details that allow customizing Newsprofin ads according to the user's interests. This way, the developers are more successful in attracting people to click on the advertisements and increasing their pay-per-click revenue. Unfortunately, some details that are accessible from your browser history might include personal information and put your privacy at risk. Thus, it can either lead to privacy-related issues or even identity theft in the long-run. Experts recommend you to remove Newsprofin if you want to protect your information. Newsprofin is a potentially unwanted program which can redirect to phishing sites. 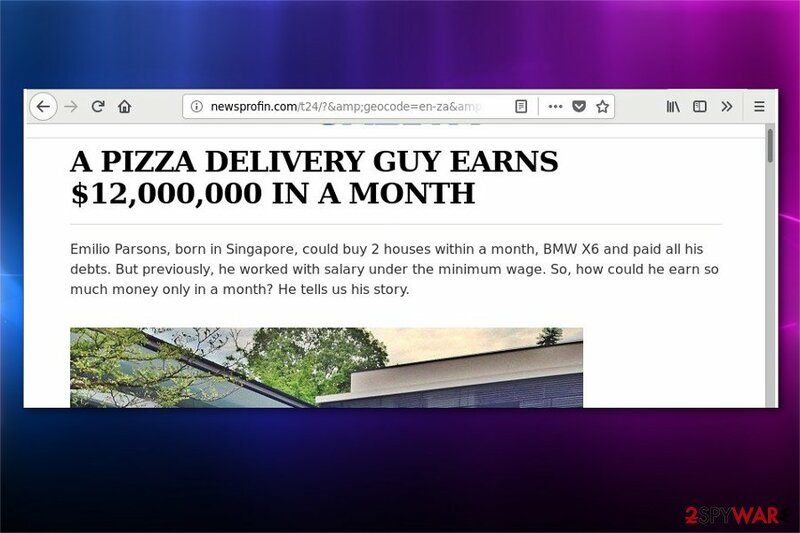 Furthermore, ads by Newsprofin might appear as banners, in-texts, or pop-ups and look legitimate. However, you should bear in mind that not all of them are safe. A vast of advertisements might lead to scam or phishing sites and trick you into revealing your credentials or purchasing the useless software. If that is not enough, Newsprofin redirect tendency can be dangerous as well — researchers report that some people might be led to a malware distribution source and infect their computers with various cyber threats, such as ransomware, Trojan horses, spyware, etc. For all the reasons mentioned above, you should perform Newsprofin removal as soon as possible to ensure your computer's safety. Install and run a full system scan with a robust anti-malware to locate and uninstall adware-related components. Additionally, you can fix your browser and computer with Reimage as it helps to eliminate virus damage and improve the system's performance. 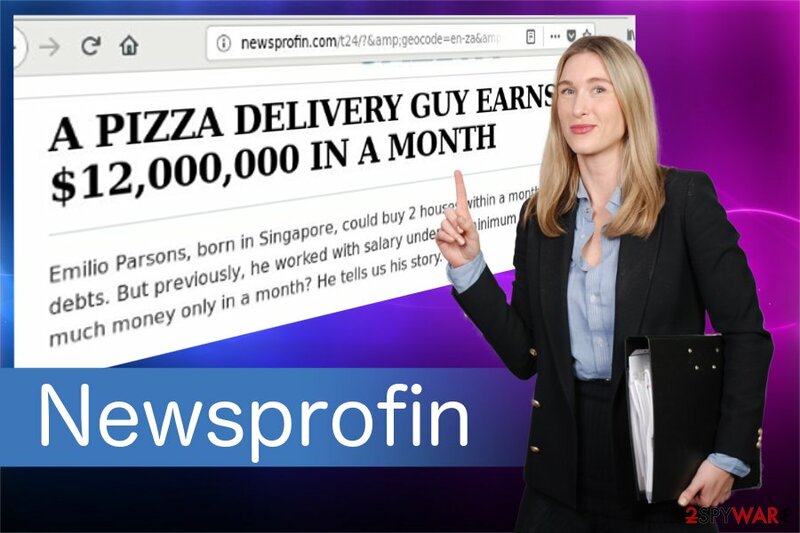 Although, you should first get rid of Newsprofin.com with a professional security tool. Un-tick checkmarks that are allowing to install PUPs. There are two ways how you can remove Newsprofin virus from your computer — manually or automatically. Researchers recommend regular computer users to rely on professional tools as they might not be experienced enough to complete the elimination on their own. For that, download and install a reliable and robust antivirus to help you with Newsprofin removal. Once it is set, run a full system scan and let it get rid of adware-related components. Note that security applications complete the elimination within several minutes and are easy-to-use! However, you can uninstall Newsprofin.com with the help of guidelines presented below as well. Please, be attentive and follow the instructions carefully. Otherwise, incomplete elimination might lead to the reappearance of the adware. It is essential to uninstall unknown programs that have been recently installed on Windows. Here, look for Newsprofin or any other recently installed suspicious programs. Below you will find instructions showing how to clean your Mac. Wait until you see Applications folder and look for Newsprofin or any other suspicious programs on it. Now right click on every of such entries and select Move to Trash. When in the new window, check Delete personal settings and select Reset again to complete Newsprofin removal. Once these steps are finished, Newsprofin should be removed from your Microsoft Edge browser. Here, select Newsprofin and other questionable plugins. Click Remove to delete these entries. Now you will see Reset Firefox to its default state message with Reset Firefox button. Click this button for several times and complete Newsprofin removal. Get rid of suspicious entries from Chrome and reset the browser. Here, select Newsprofin and other malicious plugins and select trash icon to delete these entries. Click Reset to confirm this action and complete Newsprofin removal. Here, select Extensions and look for Newsprofin or other suspicious entries. Click on the Uninstall button to get rid each of them. Now you will see a detailed dialog window filled with reset options. All of those options are usually checked, but you can specify which of them you want to reset. Click the Reset button to complete Newsprofin removal process. ^ Margaret Rouse. Spyware. SearchSecurity. TechTarget. This entry was posted on 2018-09-25 at 12:32 and is filed under Adware, Viruses. You can quickly scan the QR code with your mobile device and have Newsprofin manual removal instructions right in your pocket. How did you remove Newsprofin?